5:43 AM low -0.2 ft.
11:18 AM high 0.9 ft.
6:00 PM low -0.2 ft.
11:52 PM high 1.0 ft.
How to reach: To reach the tidal bench marks from the I-295 overpass over US Highway 17 north of Orange Park, proceed 0.56 km (0.35 mi) north on Highway 17 to the junction of US Highway 17 and Collins Road, turn right onto Collins Road and go east for 0.3 km (0.2 mi) to a 90 degree turn to the right, continue for 2.4 km (1.5 mi) to a 90 degree turn to the left, and continue on Collins Road for 1.1 km (0.7 mi) to its intersection with Malaga Avenue, then go south on Malaga Avenue for 0.08 km (0.05 mi) to the entrance of the Jacksonville Rudder Club on the left, then go east for 0.08 km (0.05 mi) to the boat ramp and pier. The bench marks are located in the vicinity of the club and along Collins Avenue. 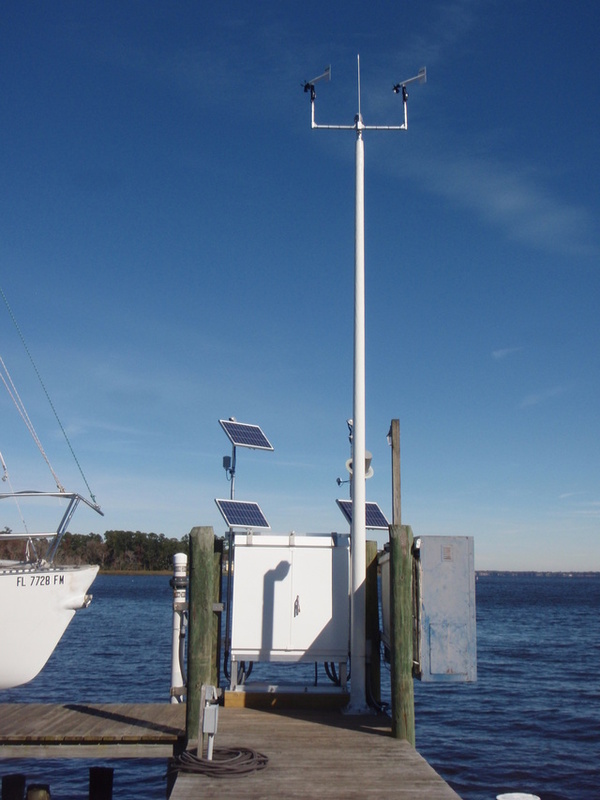 The tide gage was located at the NE corner of the wooden pier at the club.